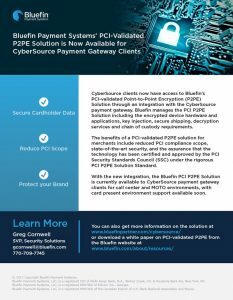 CyberSource clients now have access to Bluefin’s PCI-validated Point-to-Point Encryption (P2PE) Solution through an integration with the CyberSource payment gateway. Bluefin manages the PCI P2PE Solution including the encrypted device hardware and applications, key injection, secure shipping, decryption services and chain of custody requirements. The benefits of a PCI-validated P2PE solution for merchants include reduced PCI compliance scope, state-of-the-art security, and the assurance that the technology has been certified and approved by the PCI Security Standards Council (SSC) under the rigorous PCI P2PE Solution Standard. With the new integration, the Bluefin PCI P2PE Solution is currently available to CyberSource payment gateway clients for call center and MOTO environments, with card present environment support available soon. You can also get more information on the solution at www.bluefinpartner.com/cybersource/ or download a white paper on PCI-validated P2PE from on our resources page. Contact Greg Cornwell, SVP, Security Solutions gcornwell@bluefin.com or 770-709-7745 for more information.